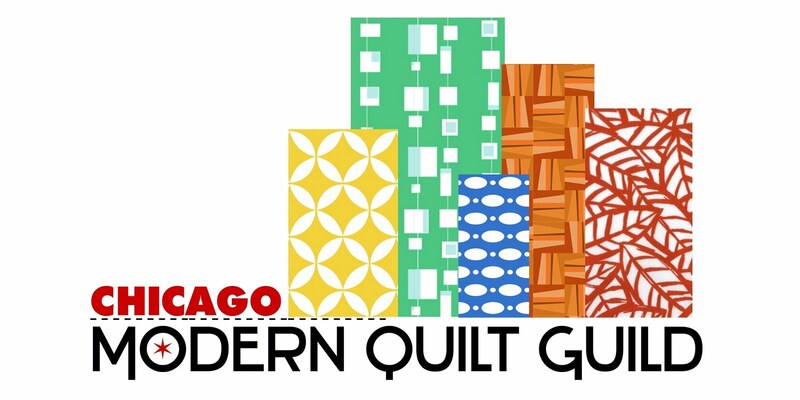 The Chicago Modern Quilt Guild: Iron Quilter? A HUGE SUCCESS! Iron Quilter? A HUGE SUCCESS! What a fun afternoon. 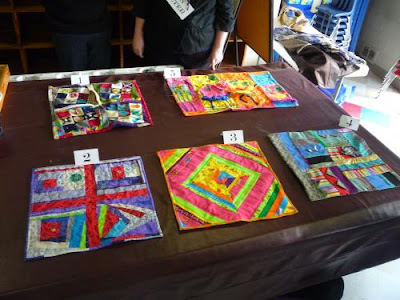 Here's what happens when teams of quilters are given fabrics and embellishments they must use to create a bound quilt whose dimensions are at least 15". 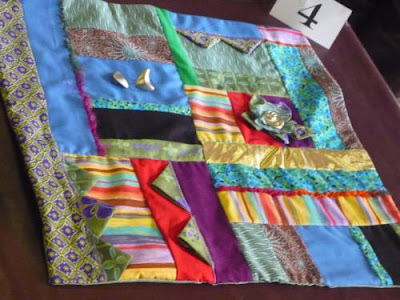 Thee five pieces were judged by the quilters for their favorite and by the judges for best use of embellishment. This quilt, #4, was the People's Choice. 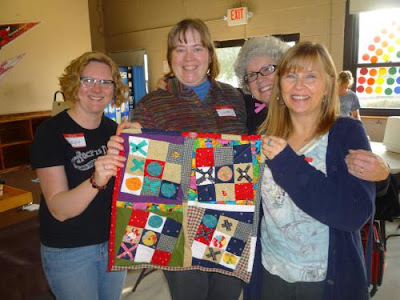 And this was its team of creators - Holly, Michelle, Terri, and Eileen. It's always interesting to see what machines people bring for sewing competitions and sew-in. Above and below represents a 60-year difference in sewing machine - Karen with a modern one and Erike with her Singer Featherweight. Ebony was the mastermind of this event, and it's a keeper. 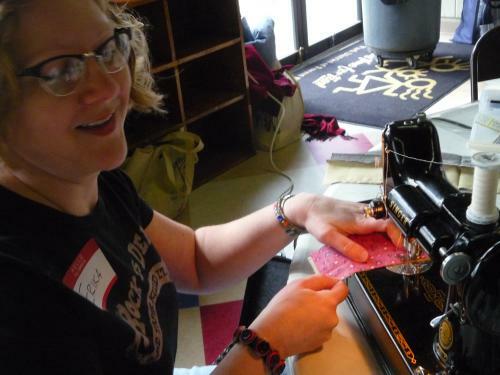 She, president Beth, and treasurer Jen organized the bags of fabrics, embellishments, and batting each team received. Ebony and Jen then judged the five entries. Here's the "winning" piece with its team - Erika, Sarah, Donna, and Rachel. 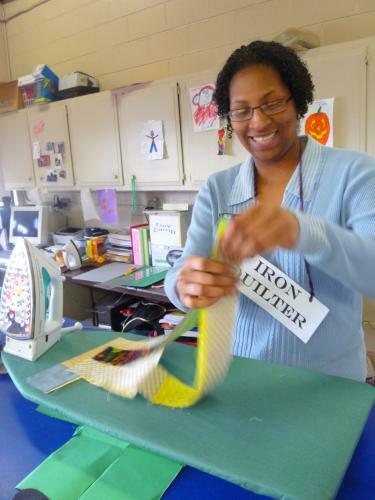 Iron Quilter? Great afternoon! 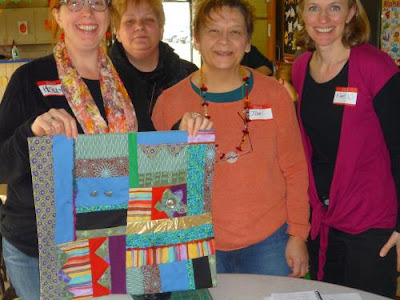 Excellent Chicago Modern Quilt Guild activity! 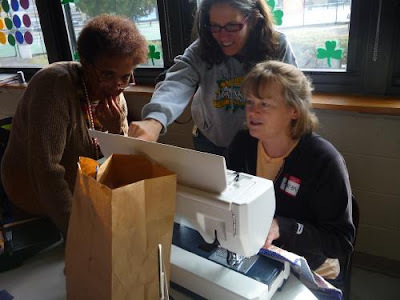 Its amazing that our bag of "ugly" fabric could end up so fun. I'll compare it to my "gingerbread house effect" theory, the more you add to it, the prettier it gets! What a great team effort! I will work with you great ladies anytime, on any project! That was a a lot of fun and the resulting quilts evokes hapinnes. Oh my gosh - how fun!! I might have to borrow this idea for the Cincinnati Chapter! Andie, borrow away! Let us know if you have any questions about how we organized the day. I'm an Ohio girl myself (Akron).